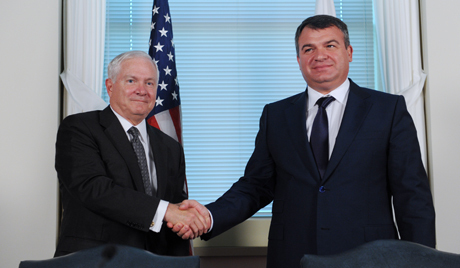 Defense Minister Serdyukov and Defense Secretary Gates signed two documents yesterday. RIA Novosti covered the event. The first document was a memorandum of understanding on bilateral military cooperation replacing an old one from 1993. The second, more important one established a ministerial-level working group on defense relations under the aegis of the U.S.-Russian Bilateral Presidential Commission established in July 2009. The document apparently says, as co-chairmen of the working group, the Defense Minister and Defense Secretary will meet at least once a year. And Serdyukov has invited Gates to Moscow. Right on, brother. Mr. Gates surely knows the $20 billion of chump change he wants to trim each year is not a lot less than what annual Russian defense budgets have been, give or take some, in recent years. That $20 billion isn’t far off what the Russian government initially proposed to spend for arms procurement each year until 2020. Saying the U.S. and Russian militaries are in the same boat when it comes to their reform efforts certainly makes for good feelings and good press in the midst of an important high-level visit. But it’s a great exaggeration that doesn’t really help anyone in the longer run. The U.S. already has full-fledged, albeit overstretched, 21st century military forces; ones that are constantly and painfully reinvented to meet the threats and demands of the future. It’s painful all right. Russia, on the other hand, is 18 years into attempts to reshape its Soviet-era Armed Forces into a modern military. It still has a fundamentally 20th century force, and not a late 20th one at that. It’s true to say that Serdyukov has ushered in Russia’s first comprehensive reform effort, and it’s very painful. But he’s hurt more by the fact that his predecessors didn’t do enough, fast enough. However, he may be doing too much, too fast. And the ultimate results may not be what Putin, Medvedev, and Serdyukov intended. But the main point remains it’s naïve to suggest the two military establishments are in anything like the same place. Similarly, it wouldn’t pay to get excited about the new framework for defense consultations and cooperation. We’ve been here several times. Like U.S.-Russian relations as a whole, over time these frameworks are driven off-track by Russian actions and U.S. overreactions. But they never die. They just get reloaded. This entry was posted in Military Leadership, Serdyukov's Reforms and tagged Anatoliy Serdyukov, Robert Gates. Bookmark the permalink. Have U.S. and Russia spoke of drills in simulated earthquake? Article on COOPERATION FROM THE SEA 98 written by Daniel Pearsnon , USN titled Russian-U.S. Naval Disaster Relief Exercise may be of intrest at your next meeting. Musta made the Russians happy to be compared to the U.S. military in any manner — reciprocity and ‘equality’ even in the Potemkin village context always makes them feel good.